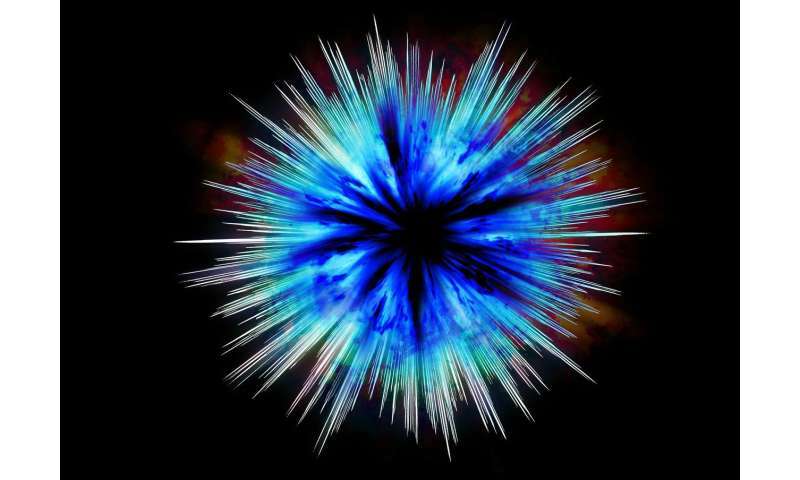 For a half-century, physicists have been trying to construct a theory that unites all four fundamental forces of nature, describes the known elementary particles and predicts the existence of new ones. So far, these attempts have not found experimental confirmation, and the Standard Model—an incomplete, but surprisingly effective theoretical construct—is still the best description of the quantum world. In a recent paper in Physical Review Letters, Prof. Krzysztof Meissner from the Institute of Theoretical Physics, Faculty of Physics, University of Warsaw, and Prof. Hermann Nicolai from the Max-Planck-Institut für Gravitationsphysik in Potsdam have presented a new scheme generalizing the Standard Model that incorporates gravitation into the description. The new model applies a kind of symmetry not previously used in the description of elementary particles. In physics, symmetries are understood somewhat differently than in the colloquial sense of the word. For instance, whether a ball is dropped now or one minute from now, it will still fall in the same way. That is a manifestation of a certain symmetry: the laws of physics remain unchanged with respect to shifts in time. Similarly, dropping the ball from the same height in one location has the same result as dropping it in another. This means that the laws of physics are also symmetrical with respect to spatial operations. "Symmetries play a huge role in physics because they are related to principles of conservation. For instance, the principle of the conservation of energy involves symmetry with respect to shifts in time, the principle of the conservation of momentum relates to symmetry of spatial displacement, and the principle of the conservation of angular momentum relates to rotational symmetry," says Prof. Meissner. Developing a supersymmetric theory to describe the symmetries between fermions and bosons began back in the 1970s. Fermions are elementary particles whose spin, a quantum property related to rotation, is expressed in odd multiples of the fraction 1/2, and they include both quarks and leptons. Among the latter are electrons, muons, tauons, and their associated neutrinos (as well as their antiparticles). Protons and neutrons, common non-elementary particles, are also fermions. Bosons, in turn, are particles with integer spin values. They include the particles responsible for forces (photons, carriers of the electromagnetic force; gluons, carrying the strong nuclear force; W and Z bosons, carrying the weak nuclear force), as well as the Higgs boson. "The first supersymmetric theories tried to combine the forces typical of elementary particles, in other words the electromagnetic force with a symmetry known as U(1), the weak force with symmetry SU(2) and the strong force with symmetry SU(3). Gravity was still missing," Prof. Meissner says. "The symmetry between the bosons and fermions was still global, which means the same at every point in space. Soon thereafter, theories were posited where symmetry was local, meaning it could manifest differently at each point in space. Ensuring such symmetry in the theory required for gravitation to be included, and such theories became known as supergravities." Physicists noticed that in supergravity theories in four spatiotemporal dimensions, there cannot be more than eight different supersymmetric rotations. Each such theory has a strictly defined set of fields (degrees of freedom) with different spins (0, 1/2, 1, 3/2 and 2), known respectively as the fields of scalars, fermions, bosons, gravitinos and gravitons. For supergravity N=8, which has the maximal number of rotations, there are 48 fermions (with spin 1/2), which is precisely the number of degrees of freedom required to account for the six types of quarks and six types of leptons observed in nature. There was therefore every indication that supergravity N=8 is exceptional in many respects. However, it was not ideal. "After making this adjustment we obtained a structure with the symmetries U(1) and SU(3) known from the Standard Model. The approach proved to be very different from all other attempts at generalizing the symmetries of the Standard Model. The motivation was strengthened by the fact that the LHC accelerator failed to produce anything beyond the Standard Model and N=8 supergravity fermion content is compatible with this observation. What was missing was to add the SU(2) group, responsible for the weak nuclear force. In our recent paper, we show how this can be done. That would explain why all previous attempts at detecting new particles, motivated by theories that treated the SU(2) symmetry as spontaneously violated for low energies, but as holding in the range of high energies, had to be unsuccessful. In our view, SU(2) is just an approximation for both low and high energies," Prof. Meissner explains. Both the mechanism reconciling the electric charges of the particles, and the improvement incorporating the weak force proved to belong to a symmetry group known as E10. Unlike the symmetry groups previously used in unification theories, E10 is an infinite group, very poorly studied even in the purely mathematical sense. Prof. Nicolai with Thibault Damour and Marc Henneaux had worked on this group before, because it appeared as a symmetry in N=8 supergravity under conditions similar to those during the first moments after the Big Bang, when only one dimension was significant: time. "For the first time, we have a scheme that precisely anticipates the composition of the fermions in the Standard Model—quarks and leptons—and does so with the proper electric charges. At the same time it includes gravity into the description. It is a huge surprise that the proper symmetry is the staggeringly huge symmetry group E10, virtually unknown mathematically. If further work confirms the role of this group, that will mean a radical change in our knowledge of the symmetries of nature," Prof. Meissner says. The DOI link is *FREE*. Yeah, well. Seems from a quick browsing the proposal replaces supersymmetry with a vastly more complex group theory. They fix the charge problem, with an "infinite" penalty. - As opposed to string theory there is no explanation why gravity is different in GR (say, by string theory AdS/CFT). - No explanation for its high cosmological constant (and other deviations from experiments: https://en.wikipe...rgravity ). Of course it can work, but so can other, more compelling theories. We'll see, eventually. Remember Lisi. There are people who can figure this stuff out if they have even a hint. @ds - thanks for the hint, I'd never heard of Lisi before. Just looking through his paper "An Exceptionally Simple Theory of Everything" - https://arxiv.org...0770.pdf - very interesting. @Nik - well, I can't pretend myself to understand the whole thing, but there are nonetheless some interesting statements to be gleaned from the paper. Just fast forward to the Discussion and Conclusions on pp.28+ and skim the remarks there. Lisi gives some interesting TED talks on the subject. While viewing one of these I found something that makes Conformal Cyclic Cosmology a la Penrose seem more likely: a completely featureless spacetime is unstable-- the critical point is that CCC would not require particle masses to vanish, but only that some region of spacetime loses time's arrow. In that case, a spontaneous symmetry-breaking would be expected, establishing an arrow of time and an expanding universe. In this case, one might expect an enormously expanded and dilute universe to contain MANY such regions, each spawning an expanding universe. As far as Lie 8 goes, I don't see anything in that geometry that would rule out CCC. By the way, the idea of this symmetry breaking establishing a direction of time is old and predates CCC and Lisi's ideas. In fact, the symmetry breaking, or "tunneling" is presumed in Lisi's theory. So, does a maximum entropy state imply loss of time's arrow? If so, this works. I think. Infinity is a mathematical concept which does not apply to the physical universe. @V4Vendicar Infinity is a mathematical concept that proves useful in making predictions that apply to the physical universe. Excellent descriptor. I am gonna use that next time I see Benni say something about infinite gravity..
Lisi gives some interesting TED talks on the subject. So, does a maximum entropy state imply loss of time's arrow? If so, this works. I think. Don't entropic rules only apply in a closed system? Is our Universe a truly closed system? Hold your fingers apart. There are an infinite number of points on a straight line between your finger tips. Next! "Hold your fingers apart. There are an infinite number of points on a straight line between your finger tips. Next!" "Infinity is a mathematical concept which does not apply to the physical universe." Exactly, unless you want to talk about "points" which have no physical significance. Just for the heck of it, imagine the impact of an accelerating expansion on a small region of the universe that contained very little matter or radiation to begin with-- say in one of those large voids between galaxy clusters. Eventually that arbitrary small region will be beyond the horizon of the rest of the universe, unable to receive radiation of any kind from "outside" its own horizon. Even if it wasn't a closed system at any earlier epoch in its history, it is certainly a closed system from then on. Although I'm not sure that this comment is relevant to the discussion. I offer it as speculation. Another little doohicky: the symmetry groups under discussion can be viewed as structures "attached" to every point in spacetime (at least, that's the message I'm getting from this technical stuff to the extent I can understand any of it) and to me that implies a sort of holographic quality in the universe, in that every point has enough information associated with it to construct the universe. That seems to follow because the various forces and particles in the universe are determined by the symmetry group (whichever one it proves to be) and the symmetry structure exists at every point. Then again, as usual, I could have completely failed to understand things. "unable to receive radiation of any kind from "outside" its own horizon. Even if it wasn't a closed system at any earlier epoch in its history, it is certainly a closed system from then on. Although I'm not sure that this comment is relevant to the discussion. I offer it as speculation." Interesting...although the "expansion" would need to be FTL in order for radiation to never reach any body within the region. Interestingly as I recall, there was a book done many years, soon after the initial flurry on superstring theory, Superstrings: A Theory Of Everything? It was a collaboration of Paul Davies and a BBC Journalist. Beyond a general lay introduction to the theory, there followed a series of interviews including such greats in physics as Richard Feynman. Mathematically, yes. Physically there is a minimum distance between each point and therefore not an infinite amount. Roughly guessing there's a maximum of 6.25e+33 points you can make between your fingers. Perhaps the infinities in equations have been pointing to something. So far, it seems to point to that math and physics aren't the same thing.